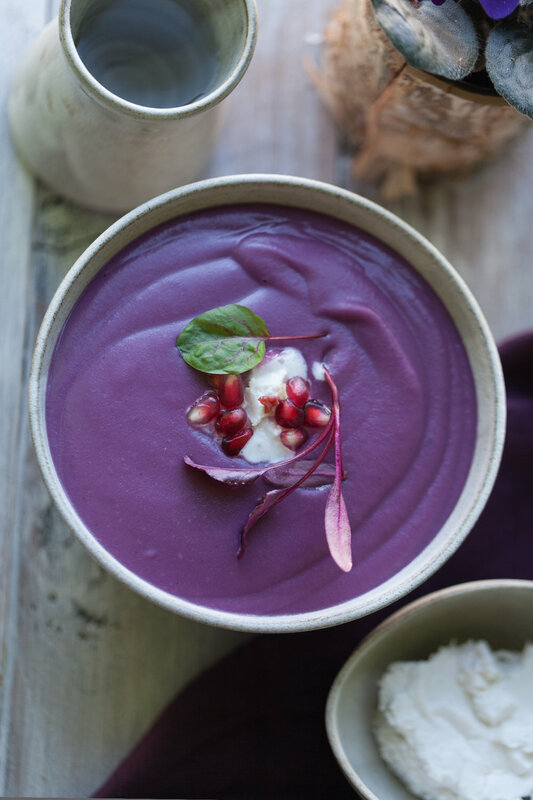 Purple sweet potato and parsley root soup. The look alone will have you salivating! 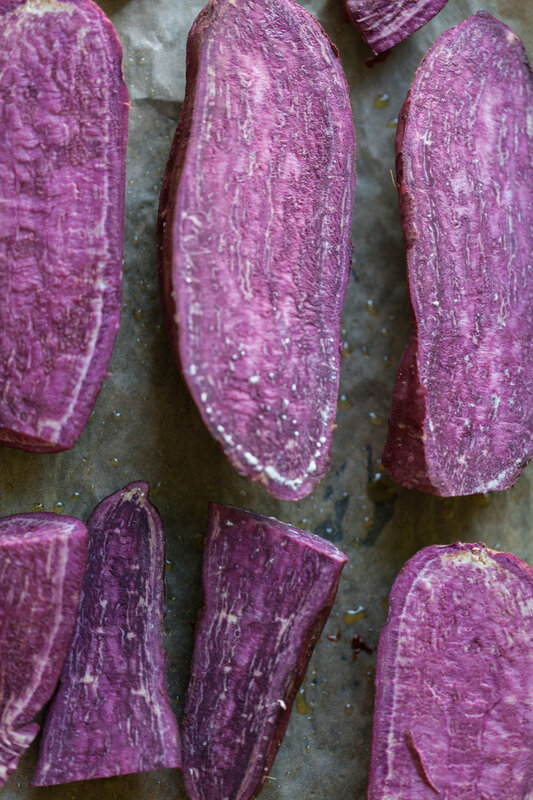 There are a number of varieties of sweet potato, but perhaps none are as toothsome as the purple sweet potato, which boasts the most beautiful aubergine color both inside as well as outside. I was first introduced to purple sweet potatoes when working closely with Good Eggs, a farm-to-fridge grocery delivery service in the city. Norwich Meadows was growing purple sweet potatoes and the first time I had them I was like, "WOW!" This recipe will totally blow you out of the water, plus would be fun to make with kids—just for the color alone! I always recommend baking versus boiling the sweet potatoes when softening them for most recipes if you have the time. This avoids them losing valuable minerals in the liquid, which you’d be discarding if you chose to boil them. Plus I find baking them helps concentrate the natural sugars in sweet potatoes and make them that much more delectable for eating—particularly after deciding to reduce or eliminate re ned or added sugars in your diet. I recommend first baking your sweet potatoes. This helps concentrate the flavors and reduce any mineral or nutrient loss. Once you're finished baking the potatoes, remove the skins and add the potatoes to the homemade vegetable broth. 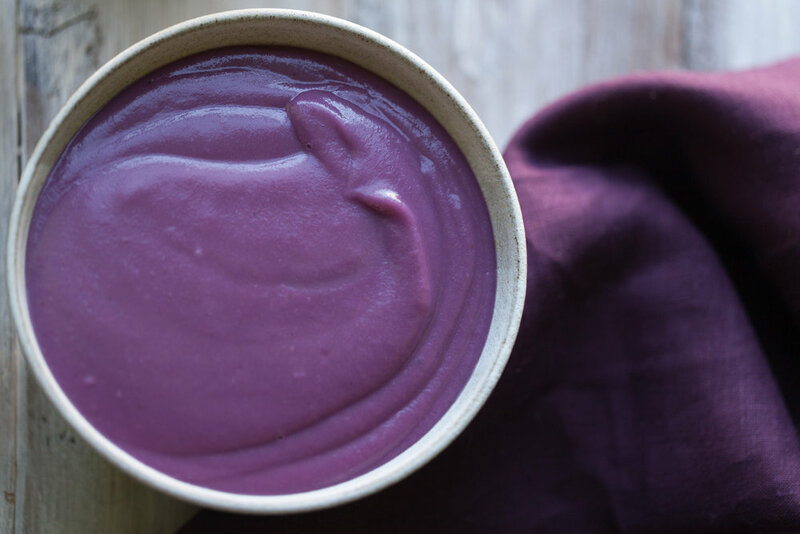 Blend the purple sweet potatoes and vegetable broth until it's a luscious puree. Add coconut cream, or my favorite, Anita's coconut yogurt to the soup. Top it off with some pomegranates and microgreens. It's delicious! This recipe was originally featured in my SugarDetoxMe Holiday Meal Map. Line a baking tray with parchment paper. Rub 1 tablespoon of olive oil over the sweet potatoes and place the potatoes cut side down on baking tray. Bake for 30 minutes at 350°F or until soft. While potatoes are baking, place the remainder of the olive oil in a medium soup pot. Sauté the shallot for 2 minutes or until fragrant and translucent. Add the garlic, ginger, parsley root, cumin, salt and pepper over medium heat for 3 more minutes. Add 2 cups of broth and stir over medium-low heat to soften the parsley root, about 7 minutes. Remove baked potatoes from oven. Let cool so you can peel potato skins. Add baked sweet potato flesh to the soup pot. Puree until smooth with an immersion blender or food processor. Transfer the puree into the pot and add remaining broth. Simmer gently for another 5 minutes. Top with coconut yogurt ( or cream ), pomegranates and serve.